He compares the opponents of the trolleybus to the Taliban. But who is Peter Connolly ? : STOP THE TROLLEYBUS ! He compares the opponents of the trolleybus to the Taliban. But who is Peter Connolly ? In a recent letter to the Yorkshire Evening Post, Peter Connolly compared those who oppose the trolleybus to the Taliban. He accuses us of spreading half-truths, while he accepts as Gospel truth everything that is said by NGT. Yet, transport experts, including a retired professor from the internationally-recognised University of Leeds Institute of Transport Studies, have pointed to fundamental flaws in the project, none of which seem to have been satisfactorily addressed. But who is Peter Connolly? Born in Ireland on the 26th September 1948, and described by author Janet Douglas as “a small property developer and restaurant and bar owner” Peter Connolly began his career by buying up and refurbishing property along the River Aire. In 2000, he won Leeds Civic Trust’s Spirit Of Leeds Award “for bringing originality and style to property development in Leeds” It was his idea to bring one of the derelict barges on the Aire to Woodhouse Lane where it now functions as a bar called the Dry Dock. He was a director of the Chamber of Commerce between 1996 and 2001, and is currently a member of the Chamber’s planning group, together with several others including representatives of Arup, a firm of consulting engineers in the news recently for providing Leeds City Council with a £4.2 million estimate to refurbish the West Park Centre. Arup also acted as consulting engineers for the Arena. Peter Connolly is the developer responsible for Arup’s offices. In June 2012, his company Yorkshire Design Development purchased the former Yorkshire Chemical site on Black Bull Street, a stone’s throw from Allied London’s New Dock, the former Clarence Dock. In December 2012, the company received a £2 million loan from the Local Enterprise Partnership’s Growing Places Fund to prepare the site for development. 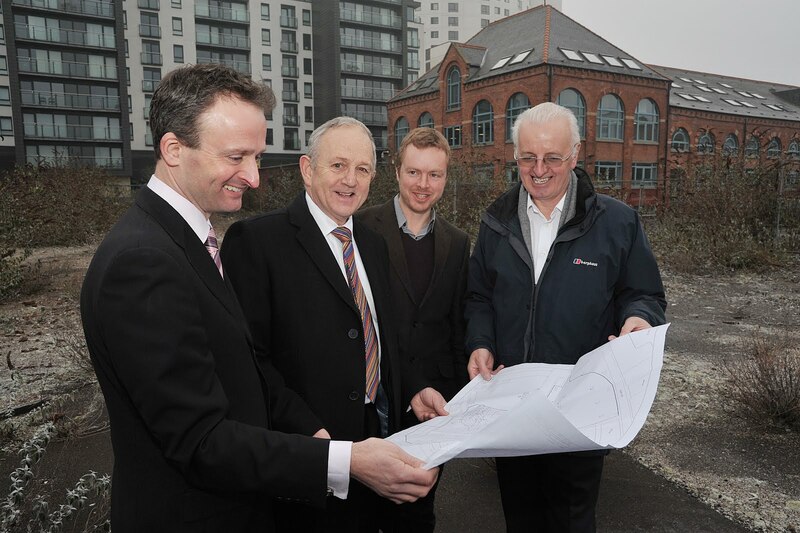 Plans were recently unveiled for a new campus for Leeds College of Building on the site. These were presented to a Leeds City Council plans panel in June 2012. Ye Gods where do we get these idiots from,and they run the council The mind boggles. I wonder what qualifications they have ,The picure is like the three stooges. Isnt this the same Peter Connolly who has a serious amount to gain from ngt going past the sites he owns! As i recall he also came up with some hair brained scheme to move the crown pub as part of his silly tetley redevelopment plans. “Taliban! Infadels,” What a ridiculous analogy! The simple fact is that the over-whelming majority of Headingley residents are opposed to the Trolley Bus for many reasons. We are articulate and intelligent people and feel that any opposing views are being ignored whilst we will be expected to pay for the scheme. “Well compensated?” Let those in favour have the ‘Folly Bus’ in their front gardens! My greatest angst is the impact on the wildlife and biodiversity. THERE ARE NO MORE GREEN SPACES LEFT IN HEADINGLEY. We have been developed to death! Those of us who are not in adulation of concrete will continue to oppose it and take the moral high ground.